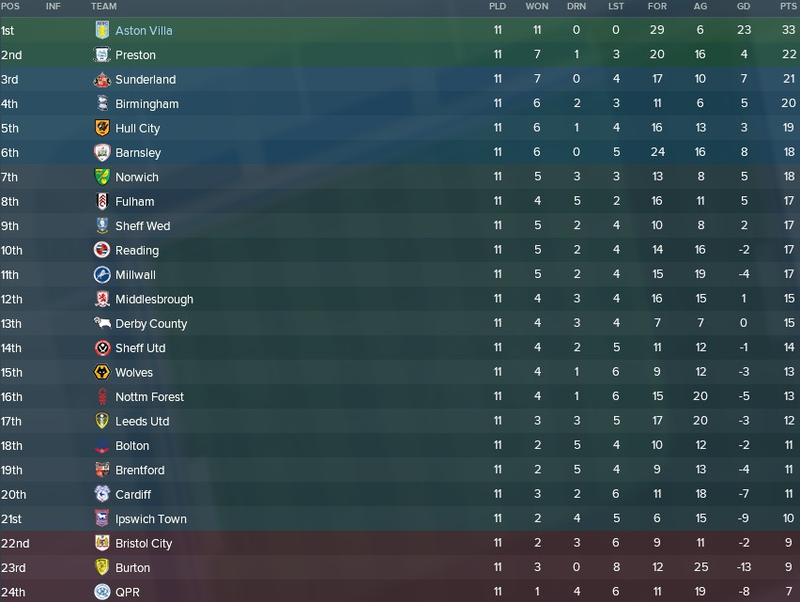 I decided to have a crack at a challenge I've set myself before but never followed through on, restore my beloved Aston Villa to their former glories and to the top of the pile in England! 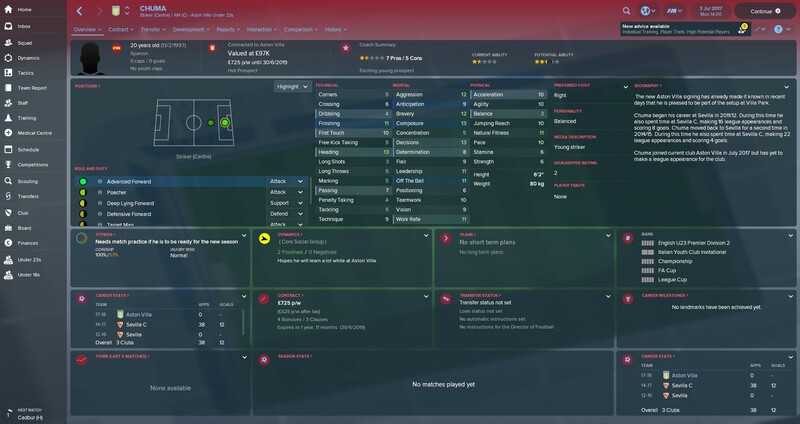 And this time I thought I may as well create a career update thread about it. A hero is a hero, but everyone loves a good Villan. Founded in 1874, Aston Villa are England's sixth most decorated club with 25 trophies (seventh behind Everton if you ignore discontinued competitions), one behind Tottenham and a meagre 41 behind Manchester United in the #1 spot. Unfortunately for me, only 2 were won in my lifetime, the League Cups in 94 and 96, and since I was only born just under 3 months before the 94 win, I don't remember too well. Well, it's 3 in my lifetime if you include the 2001 Intertoto cup, which Wikipedia does so I'm counting it! But it's not just the last 24 years that have been relatively trophy barren for the club as 6/7 League Titles and 6/7 FA Cups that the club has won were in the pre/inter-war era of football, with Villa's post-war success being limited to 5 League Cups, the 1957 FA Cup, the 1980-81 League Title and most importantly, the 1982 European Cup. Not a bad haul, but for a club that was once the pinnacle of English football, it is a disappointment. Even more disappointing, 34 years after being crowned European Champions and after 28 years in the top flight, Villa were relegated after one of the worst seasons seen in the Premier League by any club, and the club now finds itself trying to claw itself back at the second time of asking. Villa's home ground is Villa Park, one of the country's biggest and, in my very biased opinion, best stadiums. Villa Park is also home to the famous Holte End, with a 12,000 capacity making it the biggest behind-goal stand in the country (fact may be out of date). The stadium also has a decent expansion capacity of around 50,000 - 55,000, and if I'm successful enough, maybe I can finally get the North Stand redevelopment that's been planned for about 15 years. 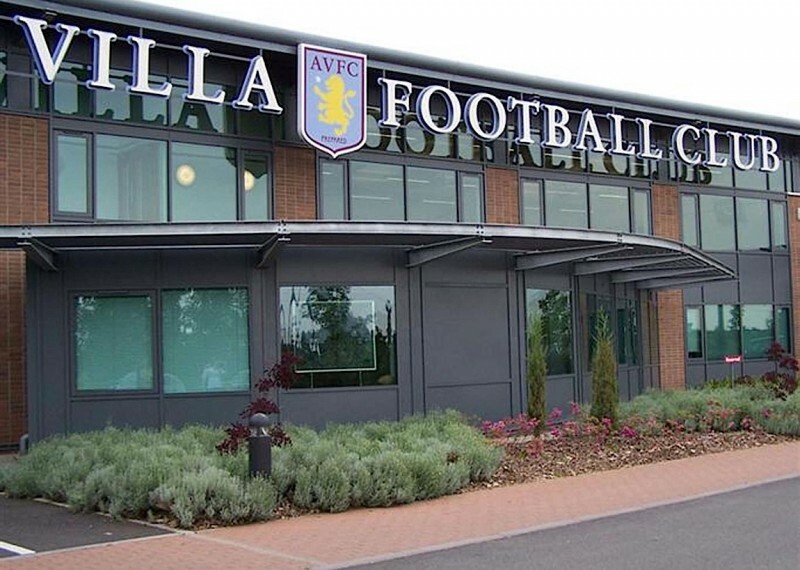 Throw in some excellent training facilities in Bodymoor Heath and a decent youth production line, and the club is very much suited to life in the Premier League. A good squad for the Championship, with some deadwood to shift, some decent prospects and a good core of good players like Terry, Chester, Hourihane, Hogan and Kodjia. Areas to strengthen will be the LB position as Taylor is my only option and probably a better CB or DM option as there are some worries with injuries there, and perhaps a backup winger. With the right additions and holding on the better players, promotion is well within reach. 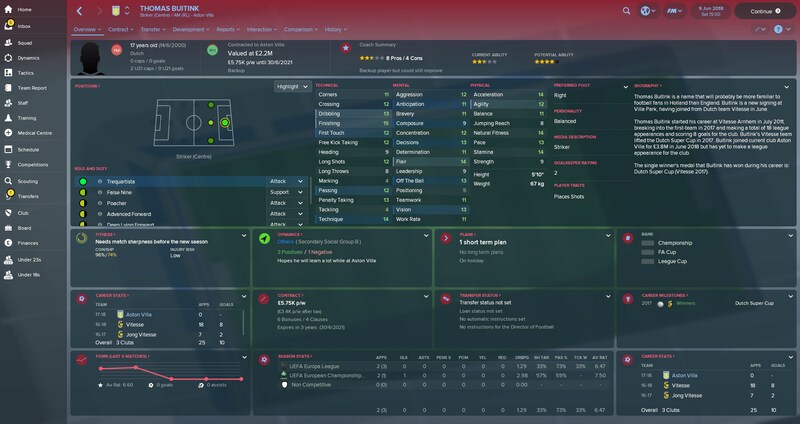 I will admit that as I've been having some difficulties on this year's game so far, I did put my reputation and coaching badges to the maximum it would go. As a result, it looks like I was a decent little striker before the horrific leg break that forced me into early retirement and management. Now onto the actual save! * - Record set in Championship where 138 is the max points total, whereas the max Premier League total is 114. 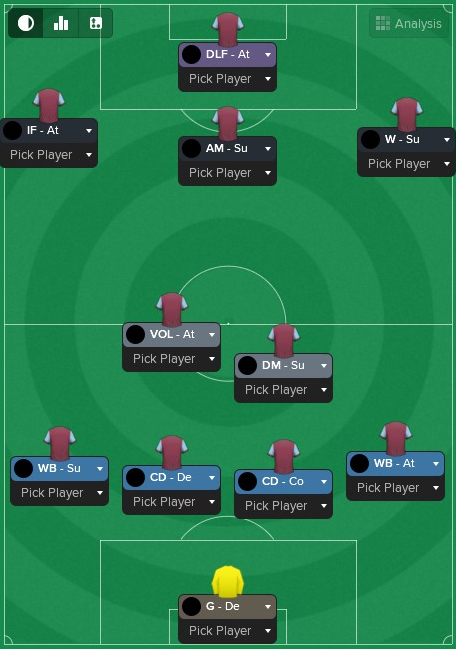 I decided to go with a 4231 for now as I reckon it'll get the best out of Villa's attacking players whilst playing some good football, but I reckon I'll try and develop some other options on the side as the season progresses. This 4231 is based on the tactic from Cleon's excellent "4231 Explained" thread over in the Tactics forum. I say "based", it's pretty much the exact same but with a couple of PIs added. One thing I've noticed on this year's game is that there are a lot of good newgens on free transfers at the start of the game, normally I sign a few, but on this year I really threw the net out wide and hopefully some of them will come good. Some look decent, but I imagine most will be moved on in the near future and will be a nice little money spinner. Georges-Kévin Nkoudou - Loan from Tottenham. Whilst I have a lot of cover on the wings, I only have 3 actual wingers, so I brought in Nkoudou as a backup so Green and Adomah can have a rest from time to time. Reece James - £2.4m from Wigan. With Taylor being my only LB, and only the injury-prone De Laet as cover, I needed a backup and James fit the bill perfectly. 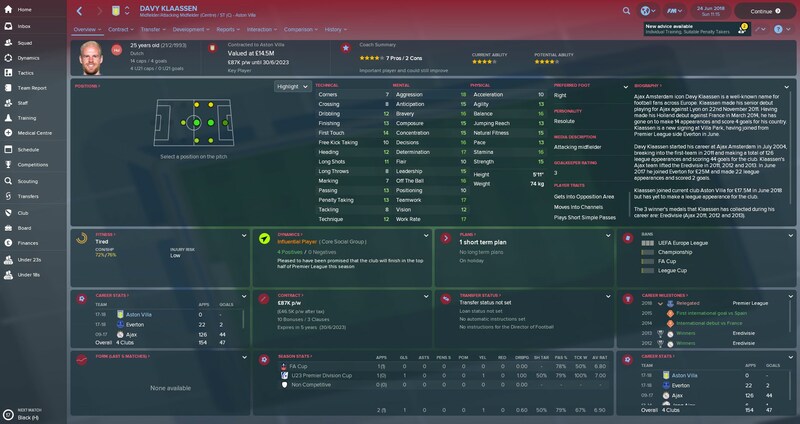 A decent little player, fairly cheap and a bit of potential so hopefully he could do a job in the Prem too. If not, I'm sure a Championship club will want to pick him up so I don't see much risk in this signing. 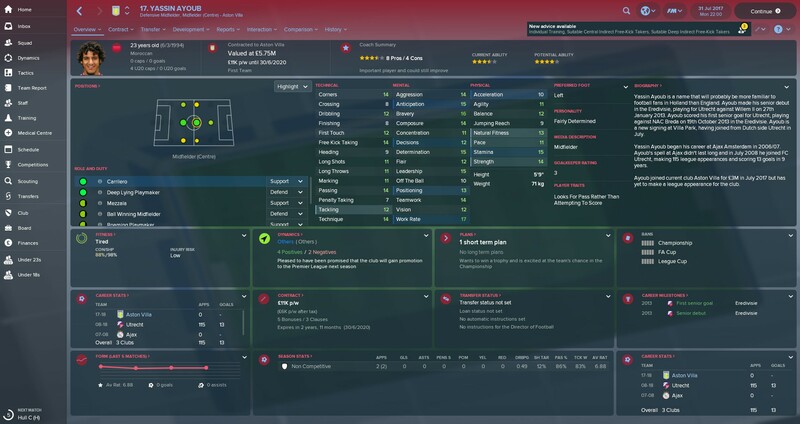 Yassin Ayoub - £3m from Utrecht. I'm planning on playing Conor Hourihane in the Segundo Volante role in my team, however, I realised that none of my other CMs really fit in that position so I got Ayoub in to rotate with Hourihane. It's a bit of a risk as are a lot of my purchases from the Netherland on most of my saves, but he looks decent and more than able to be a rotation player. 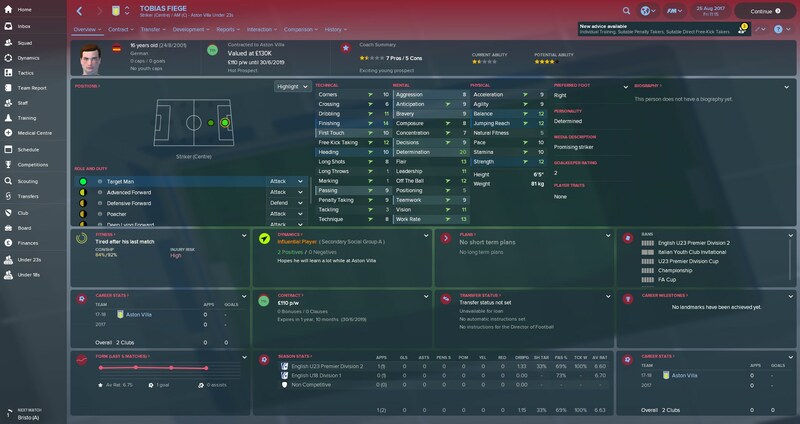 Kristoffer Ajer - £10m from Celtic. A big signing that put me close to violating FFP, but Ajer is a talented player that I want to be a fixture of my team for years to come. For now, he'll play as a DM, but I reckon he will replace Terry in my defence in a couple of years, but for now, I can't handle such a torrid lack of pace! 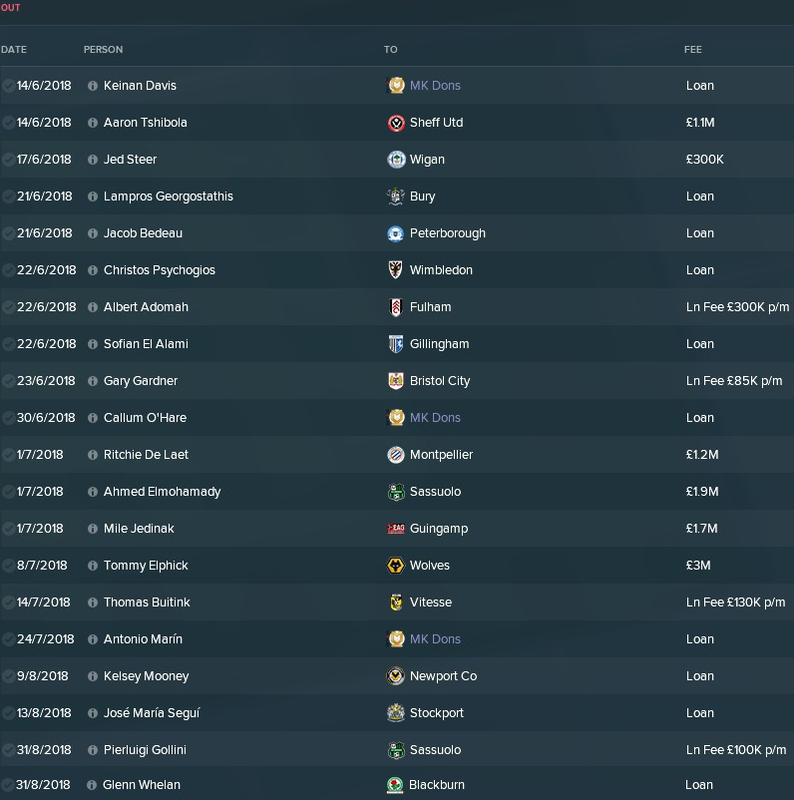 Mainly loans out for some of the younger players, but also I sold Lansbury to maintain within FFP and got some of Bjarnason's and Richards' wages off the books with a bit of cash coming in too. 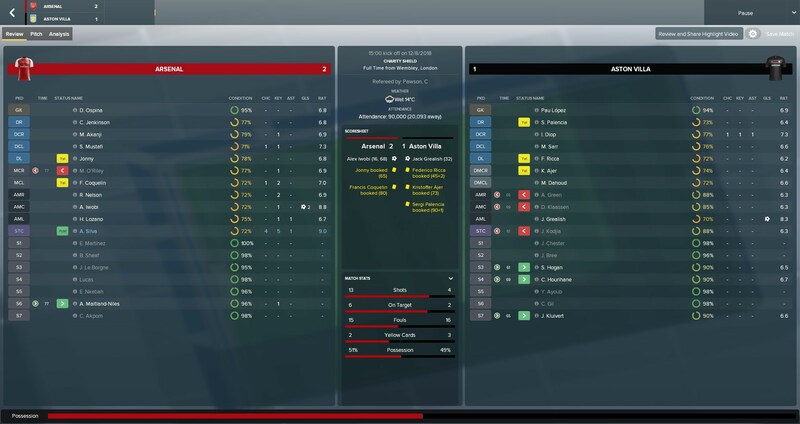 A pre-season designed to build both fitness and confidence, and it really worked, plenty of batterings that has left most of my players with 95% Match sharpness and excellent morale all around. A 100% record to start the season, I wasn't expecting that! Already 11 points clear and playing some great stuff, not to mention hardly conceding too. The wingers Adomah and Green have been great and Hogan's been chipping away too. The morale of the team is excellent and we're getting goals from all over the pitch in all sorts of ways too, which is really pleasing. 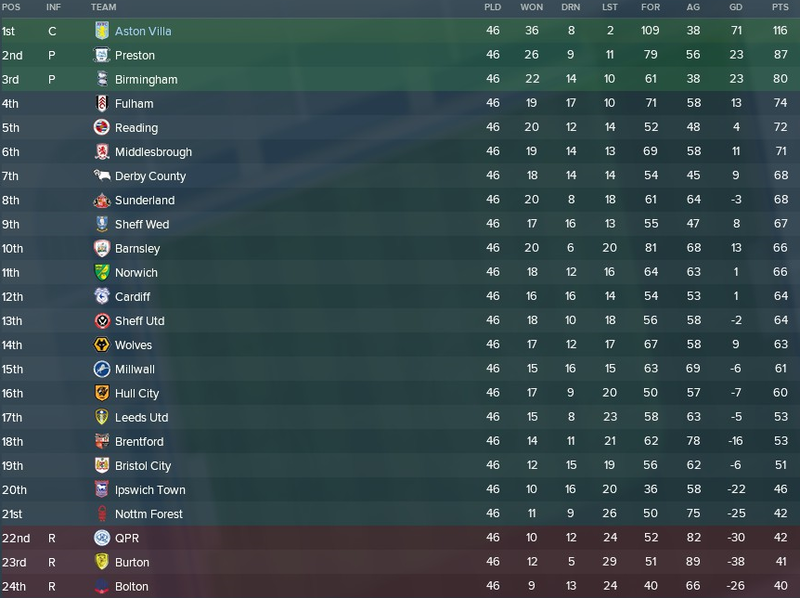 I almost definitely won't keep this up over 46 games, but I'm well on my way to the promotion places, I just hope I don't slip up too massively. I told the board I'd get to the Quarter Finals this year so I could get a bigger budget, and I've had a few very fortunate draws to put me into the 4th round. Everton was a close game, but they only had 1 point in the league at that point so weren't as hard as they seemed, but I did need extra time to squeeze past. The other two games allowed some rotation to keep fitness up and I managed to comfortably get through still. Man City await in the 4th Round, so it depends on whether Pep takes the competition seriously as to whether I can get through but fingers crossed. And if I get past them, who knows how far I can go? 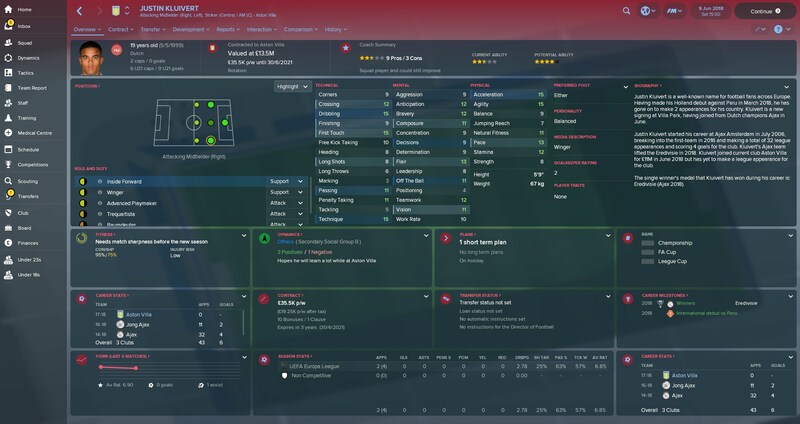 I continued my brilliant start to the season, but unfortunately couldn't keep my record at 100%, and actually ended December in a slightly shaky fashion. October started off with a few tough games, with a run of games against the promotion chasing pack behind me. 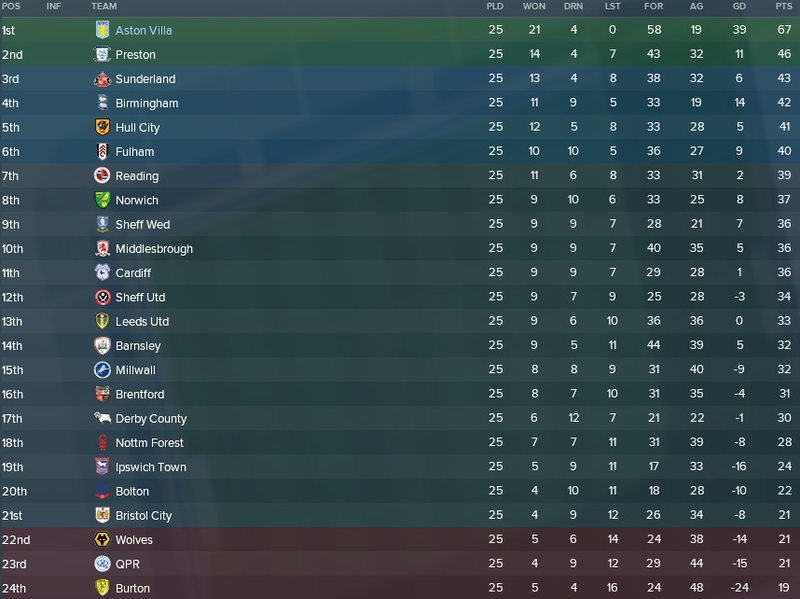 I was also quite nervous that my run would come to an end at the hands of one of my rivals, first at Wolves then at Birmingham, but I managed to edge through two edgy games. I was convinced Blues would beat, especially after Chester was sent off with 10 minutes to go, but I held on to the 1-0. 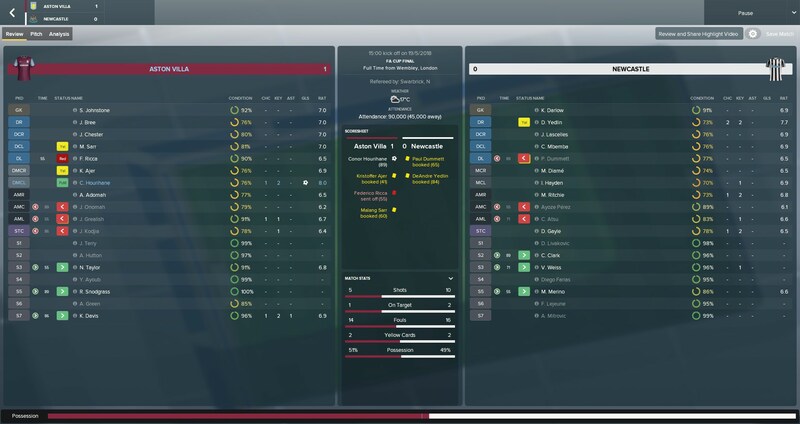 Sheff Weds were the first team to not lose to me, they set up to defend and fair play to them, they defended really well and frustrated me all game. I've actually struggled against teams that have played the same formation as Wednesday, with Bolton almost beating me playing with the same 4-1-4-1. Hogan and Kodjia have been ok, but not massively reliable, and I've had to rely on spreading the goals around the team a bit. Green, Adomah and Hourihane have all been fantastic and Hourihane especially has been the heartbeat of my team and I missed him when he was injured during December. I don't want to take my eye off the league too much, but I reckon it would be worth planning for the Premier League during the January window. There were just three recognisable names in Man City's matchday squad; Delph, Zinchenko and Bernardo Silva. If I was a real manager, I'd probably be very angered at the disrespect Pep showed a team that had at that point won every game so far by playing what was essentially City's U18 side. But I'm not, so I'm actually quite happy to have been given the opportunity to better City and progress to the Quarter Final. It could have easily been more than 3-0 but we wasted chances and took our foot off the gas after 30 minutes. Middlesbrough was a fortunate draw for the Quarter Final, but with only 4 Premier League sides and 3 other Championship sides, there was a decent chance at a good draw. Middlesbrough put up more of a fight than City, but it was still a fairly comfortable win. Leicester City await in the Semi-Finals, and over two legs I think that is definitely a winnable draw, especially since the other Semi Final is Tottenham v Man Utd. The great form shown in my first 6 months won me a new contract, which I was very happy to agree to. Only a two-year deal, but I'm sure I will be able to get a new one relatively soon. 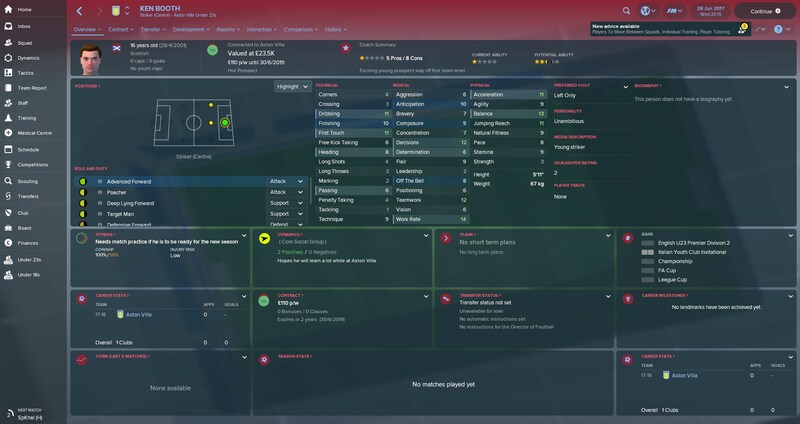 And in an attempt to improve my Youth Intake I also got the club to improve the Junior Coaching and Youth Recruitment, which are now at Good and Established respectively. Malang Sarr - £2.8m from Nice. 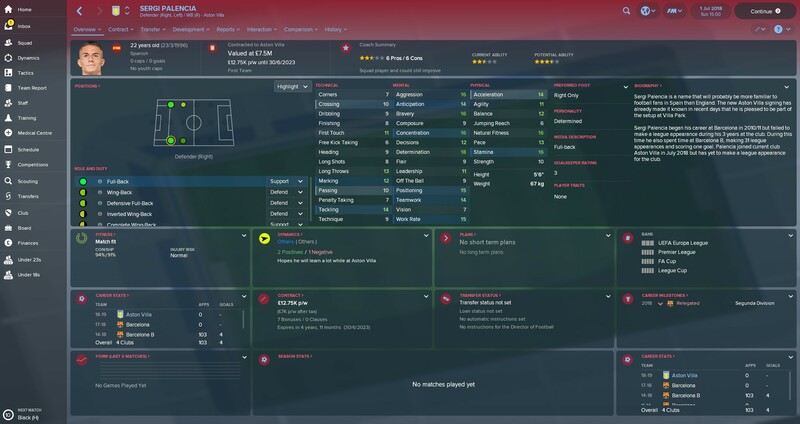 Transfer listed at Nice and I noticed no-one else was interested so thought I'd snap him up. I needed a faster CB to fit into my high line, especially to play with Terry and with one eye on next season I think it's a great signing. 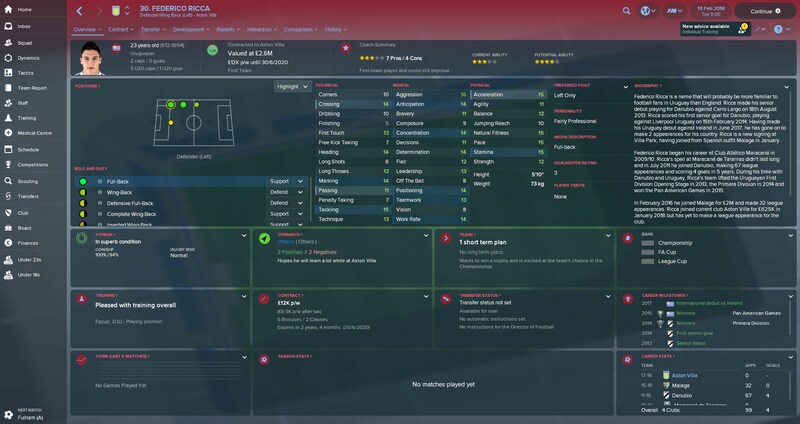 Federico Ricca - £625k from Malaga. Also transfer listed so thought I'd get him in now rather than wait for them to realise he has no business being transfer listed. 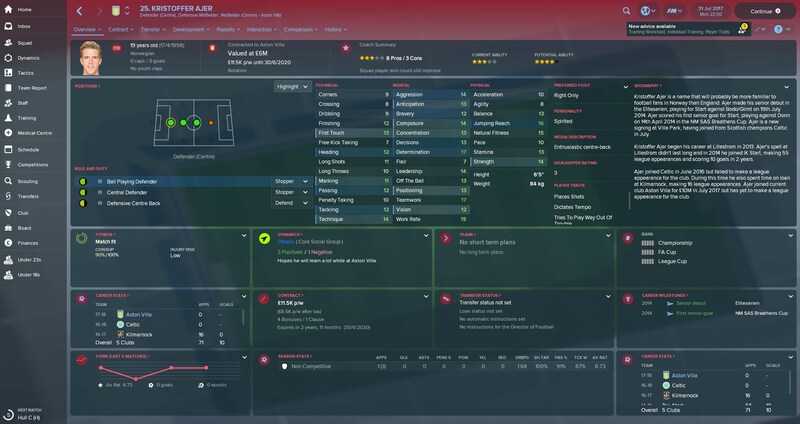 A good all round Full Back that I reckon will be my starting LB next season, now I just need to decide who to sell out of Taylor and James. Just some loans out in January, it'll be good for O'Hare to get some game time as he has some decent potential, and getting at least some of both of McCormack and De Laet's wages off the wage bill will help keep me clear of FFP. A fantastic start to the new year saw me stretch my lead at the top even further and continuing my unbeaten run until I finally ended up losing in a poor performance away to Fulham. We were second best in pretty much every department with a late consolation from Kodjia somewhat saving my blushes late on. A swift return to form however meant that promotion was secured after beating Sunderland and whilst I missed the chance to win the League at Sheff Wed, Preston failing to win the week after whilst I was playing a cup game secured me the title with 9 games to go. Hogan and Kodjia have both begun to hit good form too and all was going rosy, but since promotion it's been a bit lacklustre, with a winless run of 4 games only being avoided thanks to an injury-time bailout by Kodjia. I'm on 97 points though, with 7 games to go, I can't complain, and I now have an opportunity to rotate in some younger players. Leicester was certainly the most favourably draw for the Semi-Final. 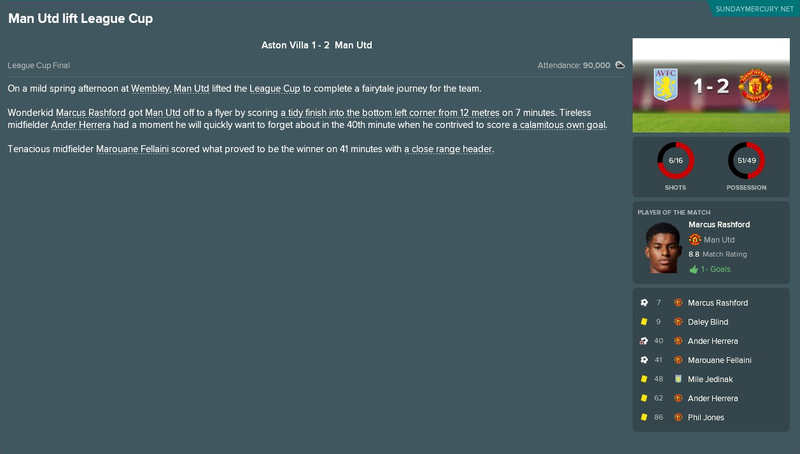 I took a 2-0 lead in the first leg, so I was disappointed to be taking back a draw to Villa Park but confident I could get through. It was a tight game for the first hour of the game with Hogan giving me the lead with a tidy finish after a quick breakaway but Mahrez pegged me back after 70 minutes. But from that point, Leicester pushed harder and harder for a goal, which gave me loads of space to exploit and I hit them on the counter and buried the game late on. It was a great win to put me into the Final against Man Utd. Whilst I'm quietly optimistic about the final, a high scoring Semi-Final with a big win at Villa Park against a team in Blue and White to put me into a Final against Man Utd reminds me of the 2010 Final which Villa lost. A disappointing way to end my EFL Cup run, I was completely second best and I only had the one shot on target, Utd were way too good for me. I made a mistake in starting Terry in this game, and Rashford ran him absolutely ragged before I took him off at halftime, which probably spells the end for him in my starting XI as his pace of 4 is way too much of a liabilty . I had more possession but just couldn't create chances, but I'm happy that I didn't get totally embarrassed as Utd certainly had the ability to do so. The FA Cup also gave me quite a few fortunate draws with only two Premier League sides and both of them are/were struggling. The 3rd round was a tough but equal tie, however, in the Replay, I was fortunate to come away with the win let alone a 3-0 win. The next two wins were fairly standard but Bristol really frustrated me in the 6th Round and I ended up getting through 4-3 on Penalties. 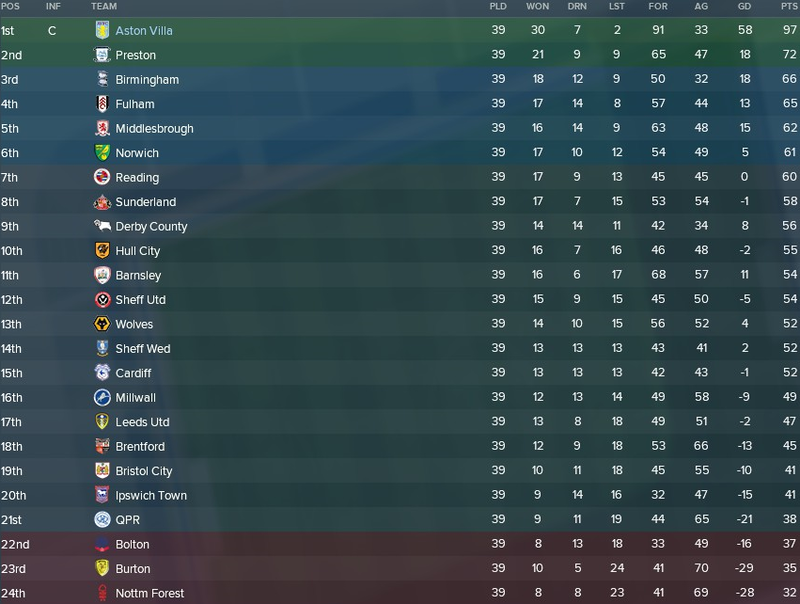 I'm actually really optimistic about the FA Cup as I have Brighton, who are bottom of the Premier League, in the Semi-Final and the other Semi-Final is Newcastle v Stoke, and I fancy being able to beat either of those in the Final, but I have to get there first so I'll take it one game at a time. I recovered from a disappointing March and finished the season with an unbeaten run to smash the points record for the Championship. With the title secured, it would've been easy to just switch off and coast through the remaining games, so it was good to see out the season with such good form, especially with rotating some of the lesser used players like Davis, Nkoudou and Ayoub into the team. We comfortably saw off most of the opposition with Cardiff being the only tough game in the run-in, with Derby clearly being the high point, especially with Davis finally getting his first league goals for the club. With the title sewn up so early, it gave me an opportunity to start making signings and shaping my team for next season which I'll detail more in my update for next season. It was a fantastic season and a magnificent way to get the team back to the top flight, but now I have to turn my eye to keeping them there, and whilst I think there are some Premier League quality players, a bit of an overhaul may be needed to get the squad ready for next season. That said, I'm positive I can carry some of the morale and team spirit over, and with the right signings, I could get maybe mid-table. 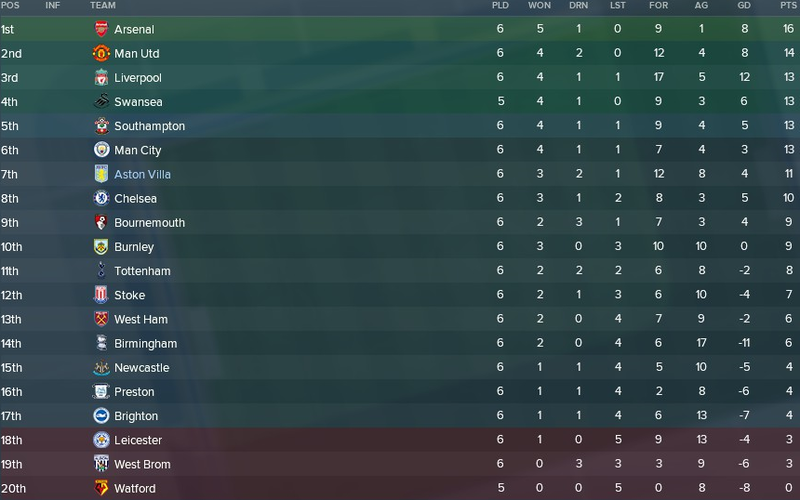 Brighton were bottom when I last updated at the end of March, but since then they won 3 of 4 league games between the FA Cup 6th Rnd and Semi Final which propelled them out of the relegation zone to provide me with a tougher matchup than I thought it would (In fact, they stayed up on GD despite losing their last 3 games). 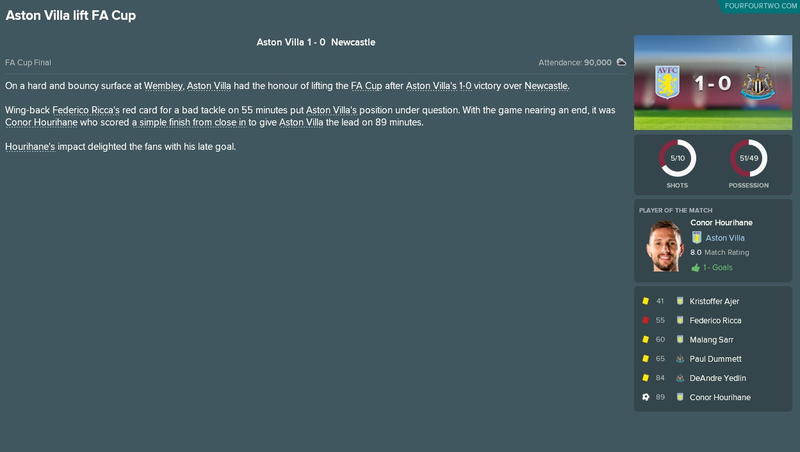 Despite this, I dominated the game and two quick-fire goals from Scott Hogan send Villa back to another FA Cup final!!! It gives me hope for next season on top of the joy of being in an FA Cup final as it is proof I can at least beat those that will be around me. "Keinan Davis drops deep. He looks to put the ball into space for Hourihane to chase. Hourihane skips past Mbemba. Can Hourihane win it for Villa? He can!!!" And now I have Europe to prepare for next season too! 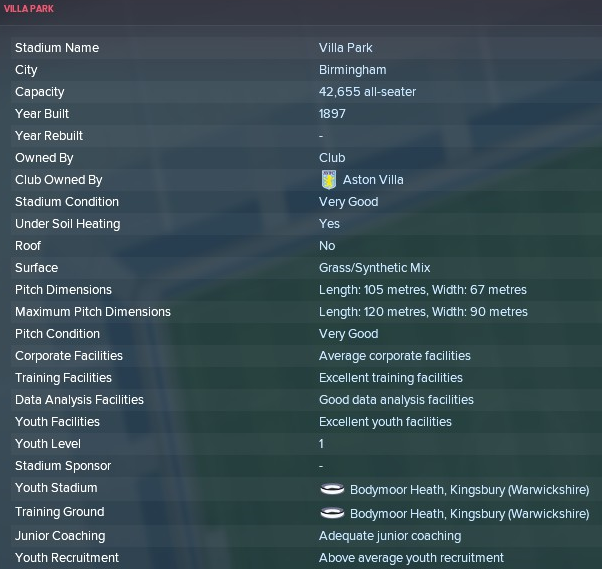 Added some more youth players to my ranks to bolster my impressive youth team, the future's looking bright at Villa Park. I'm most excited about Morisset and Fournier as both look like they could even be on the fringes of the squad this season as back-ups. Issa Diop - £13m from Toulouse. 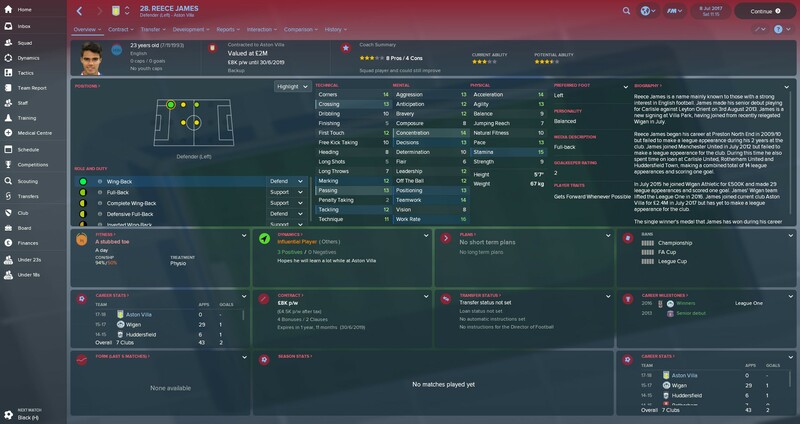 One of the signings I made after Promotion was confirmed, as I had to act quick before other teams started circling. 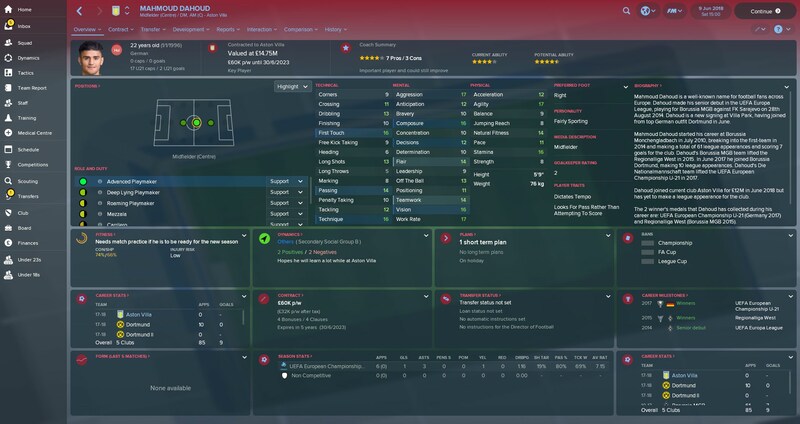 A solid young CB with lots of potential and ok on the ball too, I'm hoping he'll stick around for a while and be a solid rock in my defence for years to come. Thomas Buitink - £3.8m from Vitesse. 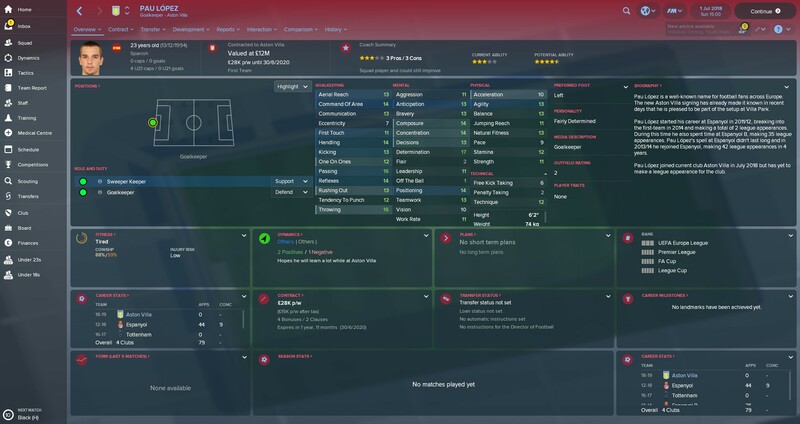 Perhaps could've been added to my youth signings, but I thought there'd be more chance of him being close to the first team. A decent young winger/striker with lots of potential that usually attracts the attention of much bigger sides, so I'm happy I could get him at a decent price. Harry Wilson - Loan from Liverpool. I signed Wilson after realising I had little wing options left after I didn't re-sign Snodgrass and let Adomah leave, whilst also having a somewhat low transfer kitty, and Wilson fit the bill for a cheap temporary option. He looks decent, good technical attributes with decent mental, but physical leaves a lot to be desired and his Left-Only footedness limits him a bit but will be a good back up. Sergi Palencia - End of Contract from Barcelona. I made a few missteps in this transfer window on reflection, and to be honest, Palencia was one of them. I wanted him last season for the Championship, and when I couldn't sign him last summer I made a point to try to get him when his contract ran out, but now I realise I was thinking about signing him for the Championship and he isn't suited to the Premier League. A decent defensive RB but rubbish going forward, which my tactics tend to rely on. He'll serve as a back up for now, but I may try to replace him in January. 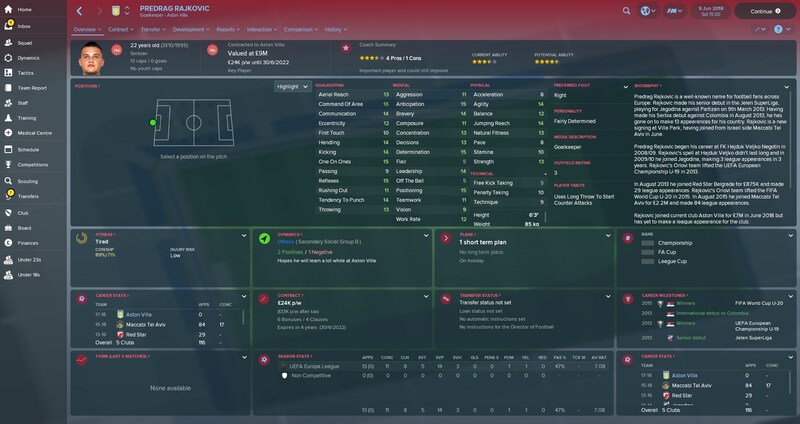 Florinel Coman - £3m from Steaua. A bit of a coup of a signing at that price I feel, a really well-rounded striker that's capable on the wing too, and with plenty of potential, I think Coman will be in the team for years to come and he'll certainly rotate well with Hogan for now. Sam Johnstone - End of Contract from Man Utd. My third GK signing of the summer, and now my fourth choice GK I'd hoped that Johnstone could just be a capable third choice to bolster my squad for the Europa League, but I absolutely have no room for him now, I wouldn't have signed him if I realised I could actually play Rajkovic. However, he cost nothing and is an okay backup, I'll probably look to loan him out at some point though. Axel Tuanzebe - Loan from Man Utd. Another like Wilson that I realised I needed more bodies but was low on cash. Unlike Wilson, I think he could reasonably challenge for the starting XI. Tuanzebe's a good CB with ability on the ball and lots of potential, he's a great addition I feel for the demands of the Domestic and European competitions I'm in this season. Mahmoud Dahoud - £12m from Dortmund. 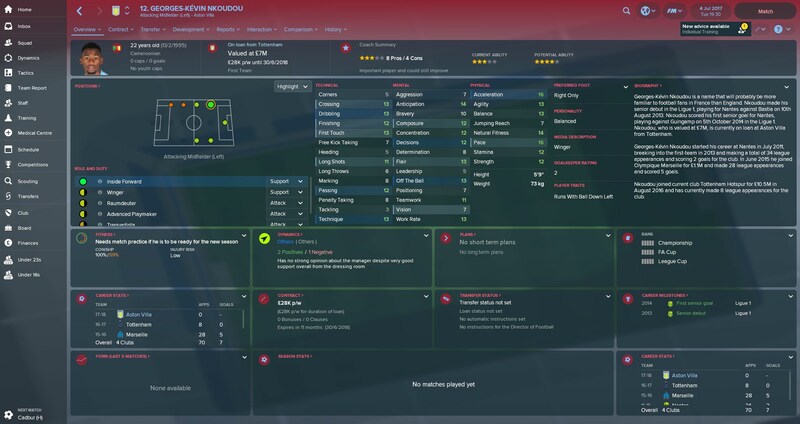 I noticed early on in the window that Dahoud was Transfer Listed, so I swooped in to sign him up. 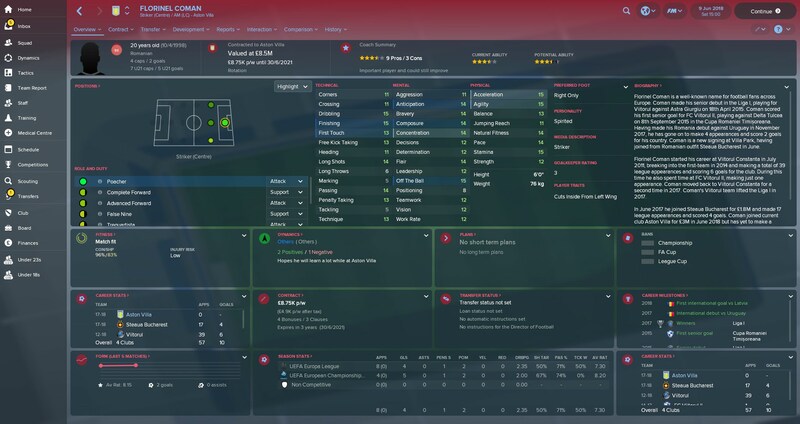 A great playmaker with good potential, but I feel I may have to build my team around him to get the best out of him. 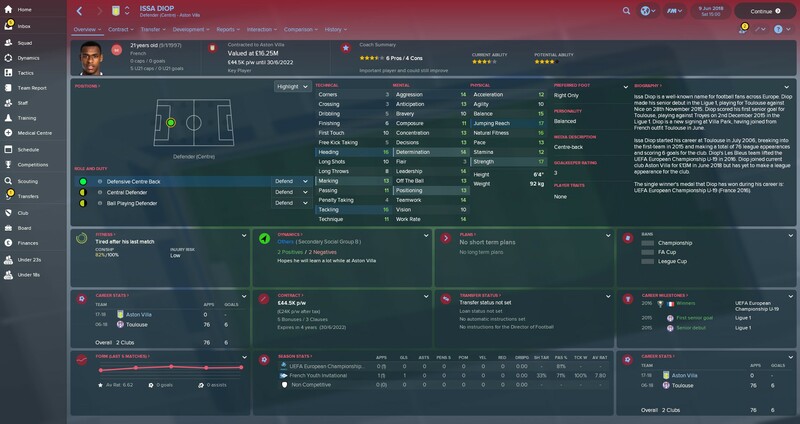 A good player, but perhaps not the best to fit into my system. I'll retrain him for now but may switch to another tactic that better accommodates him soon enough. Davy Klaassen - £17.5m from Everton. 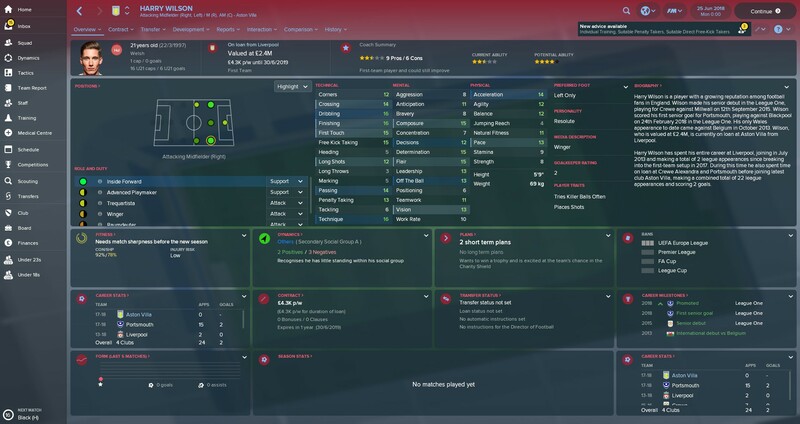 Everton got relegated so a lot of players were jumping ship, but Klaassen was the only one I wanted that I could afford. 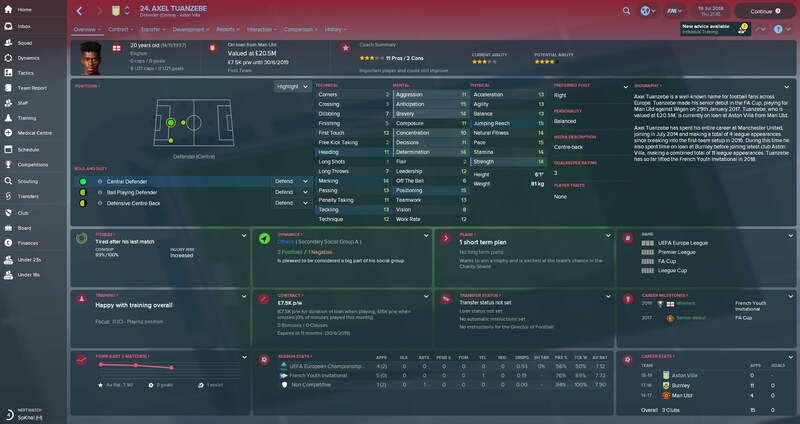 A steep price but I really like Klaassen as his mental attributes make him really versatile in midfield and capable of playing all sorts of roles which will be great with all the games I'll have to play this season. 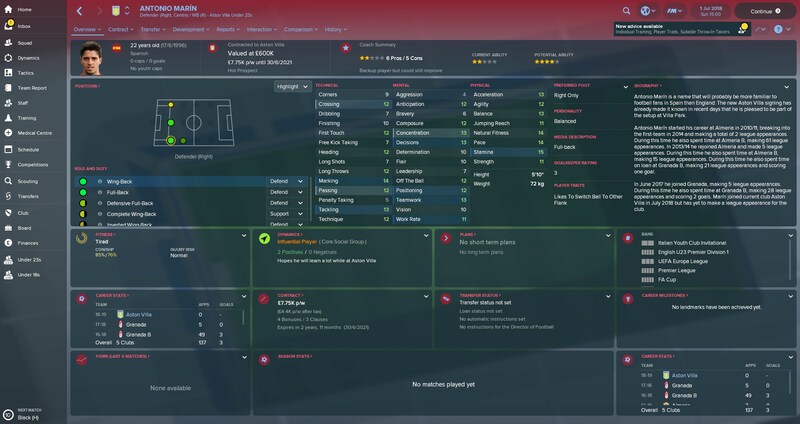 Antonio Marin - End of Contract from Granada. Similar to Palencia, but a better going forward and with more potential. I've loaned him out for now but may recall him to replace Palencia. 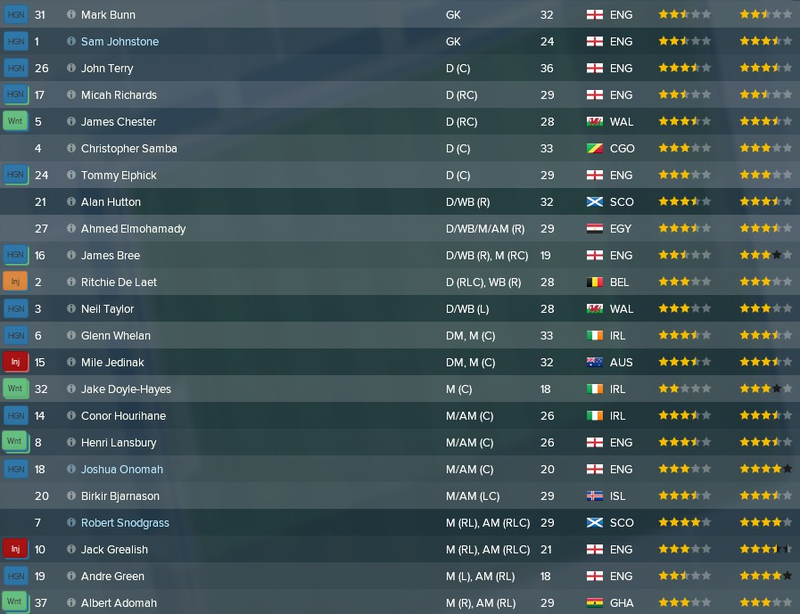 Mostly getting rid of players that aren't good enough for the Premier League as well as getting some first-team football for players like O'Hare, Davis, Buitink and other youth players. Other than that, not much to mention really. A poor showing in the season's curtain raiser. Arsenal outclassed me in every department which was disappointing. A glimmer of hope was Grealish getting me back into the game with a fantastic solo effort running the length of the pitch to score after an Arsenal corner, but we didn't create anything else really to get anything more from the game. Oh well, it was always a tough ask to win a game like this, and I'm sure I'll get a better chance to win this trophy in the future. 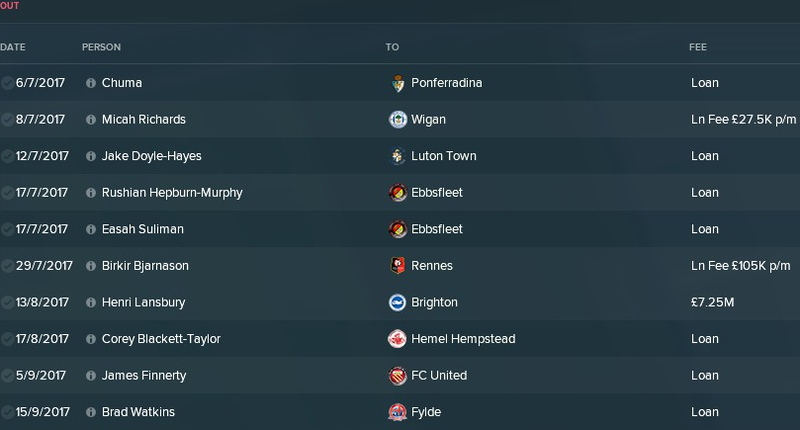 A rocky start back to life in the Premier League, but I managed to start to put some good form together by the end of September that put me up in 7th. 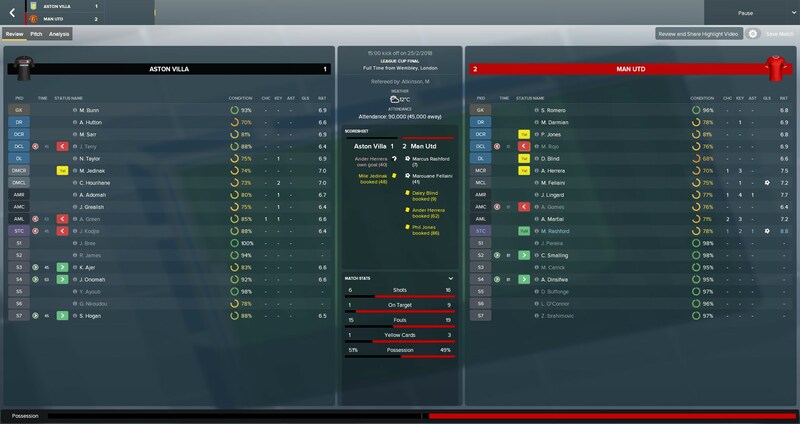 A tough ask to play Arsenal in my first two games of the season and I didn't fair well, but I got Hogan and Coman firing which turned my fortunes around pretty quickly. A great win at home to Tottenham which was a bit unexpected certainly gave a better outlook to my start. I'm currently scoring quite freely but also conceding quite freely, so if I can sort my defence out, who knows how high I can finish. On the other hand, if the goals dry up, I could be in for a long old season. Either way, it's too early to say how the season is going to pan out, and I've had a fairly favourable start to the season which has helped, but I reckon I can stick around mid-table this season, which wouldn't be too bad to create a foundation. A decent group and I managed to avoid some good teams and considering my seeding, I don't think I could have hoped for much better. 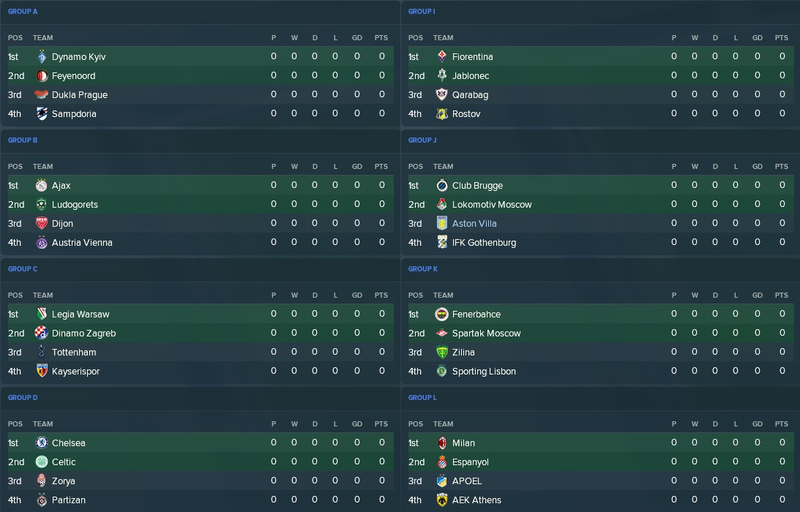 A good start to my Europa League campaign, but the theme of outscoring my opponents continues. A win away in Russia though is no mean feat, so I'm happy I could start off with a win, and I'm fairly confident I can at least progress to the knock out rounds. My quest to rectify last year's final had an eventful start. I fully rotated the team and looked to be running out comfortable 5-0 winners at one point, until Portsmouth gave me a massive scare late on, but my second XI managed to hold on to the win and put me through to the 4th Round. I’ve just stumbled upon this thread and really like the format of your series mate. 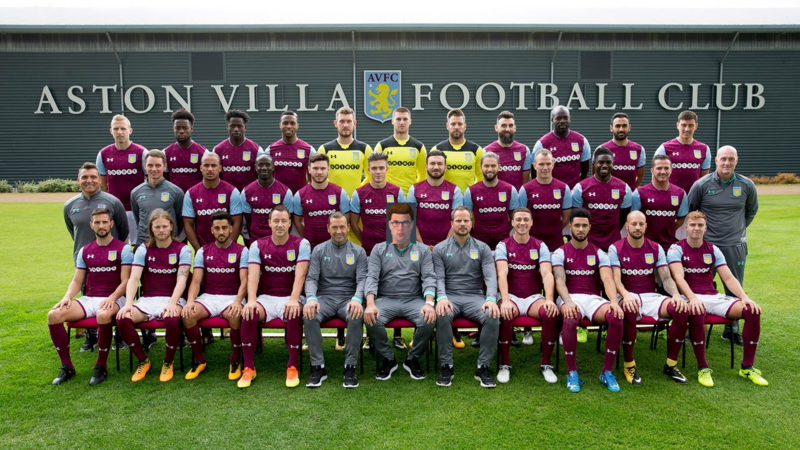 You are creating a strong and steady Villa team. I’m considering doing a save with them in FM19. Hope you come back to this series soon.